When you are looking for Top NBA Centers for the 2017/2018 season for your daily fantasy basketball lineups you may need to accept that the old style NBA center that clogged up the middle and collected rebounds is gone. Today’s Top NBA Center will set the pick and roll and then drop back and shoot the 3. They have become more of a hybrid of forward and center which on some teams means more points and on some teams has the center focussing more or rebounds, blocks and assists. The list of NBA centers are all guys you can use at DraftKings (our affiliate partner) and take advantage of our FREE Contest Ticket Offer when you join and make a first deposit of $5 or more to DK. If you already have an account at DK but aren’t winning as much as you’d like, why not try out a DFS picks service like RotoQL. It’s run by Saahil Sud (formerly Maxdalury) who is probably the best DFS player in the world. He wins millions each year and now shares how you can make the best fantasy basketball lineups that will help you go from breaking out even to cashing in! Head and shoulders above all other NBA Centers, Towns does it all for the Timberwolves. Time will tell how the addition or Jimmy Butler to the team will effect Towns’ scoring numbers but regardless he gets you fantasy points in so many ways. Blocks rebounds and a few points is what you’ll get from Gobert each night. His numbers may increase with the loss of Gordon Hayward and he’s usually a cheaper price at DraftKings for your DFS lineups. Jokic is another center that can average a double/double each night and will add in a bunch of assists and the odd block and steal. The Nuggets also added Paul Millsap which could help Jokic move around the floor more improving his fantasy numbers. With the loss of PG-13, I like Turner to really step up in 2017-2018 and improve his scoring numbers as well as his rebounds. He has started to chuck up more 3’s and already averages 2 blocks a game…nice fantasy numbers! 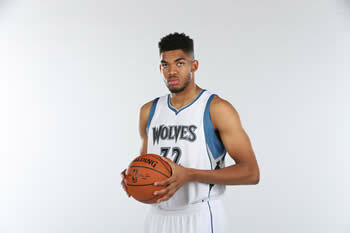 Led the NBA is rebounds (although a big drop from last year) averaging 2 blocks a game with 17 pts/g average to boot. Whiteside won’t dominate any DFS lineups but he’s a nice piece that will let you spend salary cap money in other places. Embiid is more valuable as a DFS fantasy pick because Lord knows he won’t survive the whole NBA season without getting injured for a time. His scoring may go down a bit but his rebounds may go up with the new backcourt in Philly taking more shots from the perimeter. Lopez joins a young Lakers team that should run a high tempo offense led by Rookie Guard Lonzo Ball. Lopez had fabulous numbers last year but will be a bit of a mystery based on a new team that hasn’t yet established their offense. Gasol jumped on the 3 pointer bandwagon last year which improved his scoring average. He’s not a typical big man that will bag you a bunch of rebounds and blocks but he’ll get you enough to justify value given he’s usually a below average salary cap cost. After being traded to the Blazers, Nurkic’s numbers shot right up and he was one of the best fantasy players in the NBA the last 20 games of the season. No reason why he can’t put up those numbers the entire 2017/2018 NBA season. The Celtics are a new team with the addition of Irving and Hayward and the loss of I. Thomas. How does this bode for Al Horford? He has such a well-rounded fantasy game that he may drop in some categories but improve in others. You can either take him as a flier and watch how he does for your DFS lineups, or wait and see how this new Celtics team runs their offense.